Stem cells require just the right sort of coddling to stay in their pure pluripotent, dividing state. In the lab, the nanny role is often taken on by mouse embryonic fibroblasts (MEFs), lining the culture dish as a “feeder layer.” However, these feeders have their downsides, so scientists are developing other options. Exactly what makes MEFs or other feeder lines good nannies is a bit uncertain. They seem to offer stem cells two main supports: one is a cozy surface to lie down on, with other cells to contact and the extracellular matrix (ECM) the fibroblast feeders produce; the second consists of growth factors and other molecules secreted by the feeders into the cell-culture medium. However, feeders also create complications, forcing scientists to culture not one but two finicky cell types, then separate them later when the time comes to harvest the stem cells for analysis. And feeder cells can vary from batch to batch, confounding experiments. One popular option is to switch to Matrigel, a protein goo derived from cancerous mouse cells. But Matrigel, too, can vary by batch. And in the case of clinical applications for stem cells or their derivatives, there’s an ongoing worry that mouse cells might transmit unknown pathogens, or that their proteins might activate the immune system of a person receiving them. Scientists agree that for the clinic, products must be “xeno-free,” lacking in any components from nonhuman animals. Here, The Scientist profiles several approaches for avoiding MEFs, or ditching feeders altogether. Lucie Germain cultures skin cells to make grafts for burn patients. 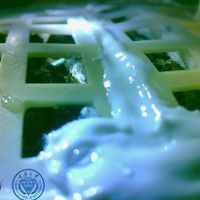 Without feeders, grafts would likely fail within a couple of months of placing them on the patient, says Germain, Canada Research Chair in Stem Cells and Tissue Engineering at Laval University in Québec City, Canada. Worried about what regulators would think of mouse feeders, her lab switched to human feeders (Int J Mol Sci, 14:4684-704, 2013). They obtained the human fibroblasts from a foreskin removed during circumcision of a newborn, which, Germain notes, limits the risk that the cells might carry a virus. As with mouse feeders, Germain’s team irradiated the fibroblasts so they would stop dividing. Otherwise, they’d outgrow the stem cells and overrun the culture. Their human feeders form a stable layer for weeks after irradiation. Mouse feeders, in contrast, lift off the flask floor after a week or so. While the human cells support skin stem cells well, there’s a bit of a time delay. Germain can seed mouse feeders at the same time as the skin cells, but it works better to seed the human layer a week before adding the stem cells. Derrick Rancourt, a professor at the University of Calgary in Canada, also uses human foreskin fibroblasts as feeders (Stem Cells Dev, 17:413-22, 2008). To inactivate their cell division, he treats the fibroblasts with mitomycin-C or radiation. The foreskin cells make key factors that maintain pluripotency, he says: both the leukemia inhibitory factor (LIF) required by mouse stem cells and the basic fibroblast growth factor (FGF) needed by human ones. He typically supplements the media with more LIF or FGF, and also adds Rho-associated protein kinase (ROCK) inhibitor to the human cultures, which prevents the cells from dissociating and undergoing a form of apoptosis. One advantage, Rancourt adds, is that while mouse fibroblast stocks tend to senesce after just a few passages, his human lines keep on growing and dividing. That means he has a larger supply of cells to mitotically inactivate and use as feeders. “We’ve gone over 100 passages with these human foreskin fibroblasts without any sign of senescence,” says Rancourt. “It’s kind of crazy that people are still stuck on mouse fibroblasts.” Those who stick with mouse cells are likely just comfortable with the protocols they’re used to, he says. For those without ready access to hospital tissues, the cells are available from Millipore Sigma (FibroGRO Xeno-Free Human Foreskin Fibroblasts, $458/vial). Although the human feeders match human stem cells in species, Rancourt notes, they would be of a different genotype. While he says it ought to be relatively straightforward to separate the feeders from any stem cell–derived transplant tissues, Rancourt is certain regulators will want proof that this is so, to avoid worry that one person’s feeder cells or their pathogens could contaminate a patient’s stem cells and cause disease or rejection. 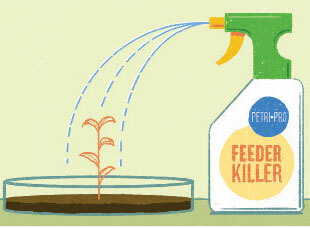 To circumvent this issue, he’s working on a method to create matching feeders derived from the stem cells themselves. 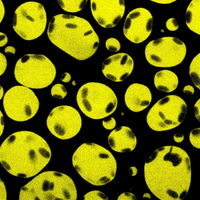 © BRYAN SATALINOBinata Joddar, an assistant professor at the University of Texas at El Paso, came up with another method to avoid using live feeder cells altogether during her postdoc in the lab of Yoshihiro Ito, chief scientist and director of the Nano Medical Engineering Laboratory at RIKEN in Wako, Japan. 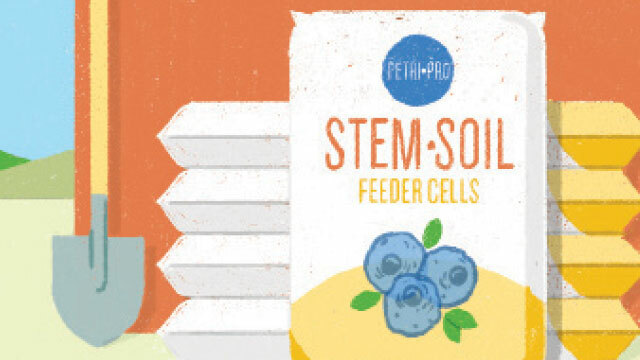 The researchers wondered if a fixed feeder layer could support stem cell growth. The cells would be dead, saving the scientists the cost and effort of culture. But their surface proteins and extracellular matrix would remain—they’d be like the jarred, preserved specimens in museum collections, reasoned Joddar. She succeeded, fixing human dermal fibroblasts in 2.5 percent formaldehyde or glutaraldehyde, washing them well, and adding human induced pluripotent stem cells (J Mater Chem B, 3:2301-07, 2015). The fixed cells are tightly bound to the bottom of the dish; Joddar says they don’t come off easily even if she tries to dislodge them with a rubber scraper. She’s even reused fixed feeder layers, though she wouldn’t do that more than once. It’s important, Ito adds, that the cells be fixed gently, so the cell membranes remain fluid (Sci Rep, 5:11386, 2015). Another option Joddar is exploring is to remove the feeder cells altogether, leaving behind only the ECM. One can do this by freezing the cells or adding detergent, says Rancourt, who has also experimented with decellularized feeders. Because the feeders were dead, he had to supplement the culture media with basic FGF (Stem Cells Dev, 19:547-56, 2010). Outi Hovatta began a crusade to wean her lab, at the Karolinska Institute in Stockholm, from feeders in 2000. In 2011, she finally succeeded. Hovatta, now an emerita professor, and colleagues defined just two factors needed to maintain pluripotency: the ECM protein laminin and the cellular adhesion protein E-cadherin. They synthesized the laminin in human cells and used a mixture of laminin and commercially supplied E-cadherin to coat culture dishes before adding the stem cells (Nat Commun, 5:3195, 2014; Nat Protoc, 9:2354-68, 2014). Scientists have several commercial options for chemically-defined stem cell underlayers and media. Hovatta’s collaborators founded a company, Biolamina of Stockholm (in which Hovatta also holds a stake), that sells diverse forms of laminin for €45–69 (US$51–79) per 100 micrograms. Vitronectin is another popular coating (for example, CellAdhere Vitronectin solution from Stem Cell Technologies at $272/0.2 mL vial). Commercial media with defined components and no animal serum include ESGRO-2i (Millipore Sigma, $197/200 mL) and Essential 8 (ThermoFisher Scientific, $209/500 mL) or Essential 6 (ThermoFisher, $175/500 mL). Many scientists worry that those costs could easily rise beyond the reach of a small academic lab. In response, Hovatta says that her methods require fewer personnel and less time to culture the cells. According to her calculations, a lab using her protocols could grow 300 times more stem cells at the same cost and time investment as they would with feeders, making it cost-effective. Another group found a way to avoid the time-consuming step of coating the culture dishes. Sara Pijuan-Galitó, then working in the laboratory of Cecilia Annerén at Uppsala University in Sweden, discovered that the ECM protein inter-α-inhibitor (IαI), found in human serum, activated the same pathway LIF does in mouse ES cells (J Biol Chem, 289:33492-502, 2014). Pijuan-Galitó, now a postdoctoral fellow at the University of Nottingham in the U.K., simply added IαI to Essential 8 media, where she suspects it engages integrins involved in cell adhesion, and plated her cells (Nat Commun, 7:12170, 2016). “It makes culturing stem cells so simple,” she says. It’s important to avoid any bovine serum albumin (BSA) in the cultures, adds Annerén, as that seems to hinder the process. 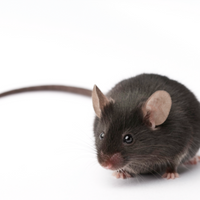 Pijuan-Galitó has succeeded in culturing 16 different mouse and human stem cell lines with IαI. Unfortunately, this ingredient is not yet commercially available. Pijuan-Galitó isolated it from the by-products of a company’s process for purifying Factor VIII, a treatment for hemophilia, from blood. © BRYAN SATALINOStem cells typically prefer a place to lie down, but growing them as monolayers means that scientists wishing to scale up their culture systems, for production of recombinant proteins or therapeutic uses, are limited to thin sheets of cells in dishes that take up a high volume of incubator space. Therefore, some researchers are working on ways to lift the stem cells off the petri dish bottom and grow them in three-dimensional suspension culture. The trick is to still give them something to attach to—either each other, or a suspended surface such as beads. Rancourt typically uses spinner flasks for this purpose, which he says is an “entry-level” setup. A suspended stir bar swirls the media so the cells stay floating. For example, NDS Technologies offers a few options ($176–$282 for a 100-mL flask, up to $1,208–$1,471 for 36 L). “What we found is that mouse embryonic stem cells actually prefer the suspension-culture environment,” says Rancourt, so long as he adds LIF to promote pluripotency (Tissue Eng, 12:3233-45, 2006). For human stem cells in suspension, he adds basic FGF, ROCK inhibitor, and rapamycin to suppress differentiation into fibroblasts (Methods Mol Biol, 1502:53-61, 2016; Tissue Eng Part C Methods, 16:573-82, 2010). Todd McDevitt, a senior investigator at the Gladstone Institutes in San Francisco, uses a rocker to keep the cells in his culture dishes suspended. 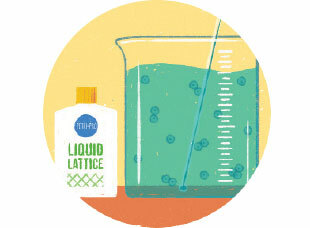 For industrial-scale, liter-order production, scientists typically use bags. Because the cells can occupy all of the media, instead of just growing on the bottom, the density of cells per mL of media is much higher, and McDevitt estimates he can save about 90 percent of his media costs compared to 2-D culture. A slight downside, he notes, is that the cells grow in little nondescript balls, making it somewhat harder to discern their health from their morphology under the microscope. It’s important to keep the cell aggregates from sticking together or growing too large, McDevitt says. If that happens, the cells in the middle may differentiate, or starve and die. Scientists can break up the aggregates with enzymes or calcium chelators such as EDTA, which weaken cell-cell adhesions. Another option to keep cell clusters distinct is to encapsulate them in a gel, such as alginate (Biotechnol Bioeng, 110:667-82, 2013). One great advantage of suspension cultures, Rancourt says, is that there’s enough media to nourish the cells for days at a time, unlike with adherent cultures that require daily care. “You set it, you forget it,” he says.